Of course, everybody understand that it’s impossible to change yourself dramatically in a week. On the eve of holidays our belief in miracles is as strong as never. Because the Internet said that. And the Instagram shows us the photos ‘before’ and ‘after’. You’ve probably already spent a week, eating a low-calorie water? Have you eaten a buckwheat or chocolate bar and you have already understand that first is pricked and second is melting too fast? Unfortunately, we are ready to damage our health in order to looked amazing in the swimming suit from neoprene. Though it’s possible to understand all women in the world – in the eve of the holidays it’s more important to have bikini than health. However, it is possible even in a week to deal with the candy-cutlet sides. How? The answer is simple – Avtar Weight Loss System. Using this revolutionary weight loss method, you will lose weight without any difficulty. Weight loss occurs by restricting the incoming energy. Due to diet, fat reserves and some water will be spent. The menu, which is offered in the book “Avtar Super-Fast 1 Week Weight Loss System“, has lots of fruits, vegetables and whole grains. All that are the sources of dietary fiber, which limits the absorption of fat and simple carbohydrates, thereby also contributes to weight loss. It’s just two day before vacations, you’re horrified to find that can’t fit into your favorite swimming suit? You shouldn’t buy a new one and spend money which are more needed during the vacations. To lose weight in two days is possible, but it will require great effort. So, what have you do to lose the weight fast? 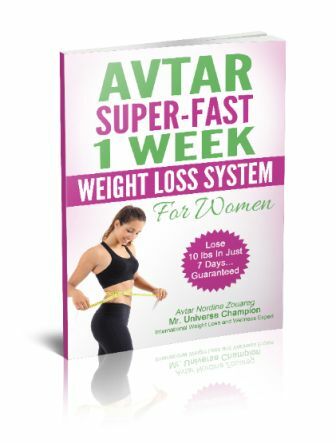 Download the slimming system Avtar now and in a week you will see the first results. Millions of people have an extra weight. To lose weight quickly for vacation, wedding or other important event, you need to pull yourself together and to follow the plan.